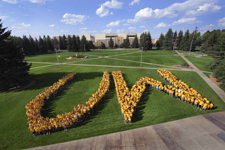 Take the reins on your graduate education - apply to the University of Wyoming today! The students featured below represent a variety of disciplines and stages of study, ranging from Geology to English and from masters programs to Ph.D. alumni. University of Wyoming faculty and administration make a concerted effort to ensure students are seen as individuals, not a number in a classroom, which is a commonly stated advantage of the relatively small community of 2,460 graduate students. Rowan researches nuclear anxiety in text, particularly as it appears in video games, and connects that research with early atomic literature. David Edmunds, Animal and Veterinary Sciences Ph.D.
David researches population-level effects and behavioral changes of chronic wasting disease in free-ranging white-tailed deer. Brady studies how climate change impacts depositional processes in rivers and floodplains on time-scales greater than 10,000 years. Dane researches G-protein coupled receptor signaling in neurons, and how they can directly associate with DNA. This has implications on pharmaceutical drug development and neurological functioning. Levi Lowder, Molecular and Cellular Life Sciences Ph.D.
Levi studies genetic engineering of microalgae for industrial, agricultural and technological applications, particularly as it relates to energy and monetary cost of harvesting microalgae for biofuels, animal feed, plastics and other commodities. Lisa is the first student at the University of Wyoming pursuing a dual education in the Doctorate of Pharmacy, and Executive Master of Business. She seeks to build a bridge of communication within the profession of pharmacy to provide better health care to our state and nation. Carina focused her JD on international law, and in particular on sexual violence against women in war situations. Michael Presho, Applied Mathematics Ph.D.
During his Ph.D., Michael researched flow through porous media. He was particularly interested in the effects that uncertain (random) parameters have on fluid flow. Johannes Raabe, Kinesiology and Health M.S. Joe's thesis research is focused on self-determination theory and will explore motivational patterns in collegiate spirit squads with the ultimate goal of providing student-athletes and coaches with a better understanding of their motivation and strategies for producing overall well-being, optimal motivation, and effective performance. Desiree Shasa, Reproductive Biology M.S. Desiree's research evaluated maternal overnutrition during pregnancy and how an obese intrauterine environment can alter fetal development. Rob Streeter, Electrical Engineering M.S. Rob studies analog signal processing and optics as they apply to a bio-inspired machine vision sensor based on the vision system of the common housefly. Maya researches learning disabilities in correlation to mental illnesses in adolescents. She aspires to be a social worker in secondary schools in Wyoming.